a specific drawer for spices, tall thin pans and for trash. I also knew I wanted to do two huge statement lights over the island and something unique with the white subway tile back splash. Think I was able to get everything on my Must Have List? Keep an eye on the windows below to keep your bearings! All photos are by Christa Rene Photography, all styling and design by yours truly, all sources tagged at the end of the post. And brace yourselves, there are, without a doubt, too many photos. Wanna walk through the details together? Oh you do?! How fabulous, let's do that! 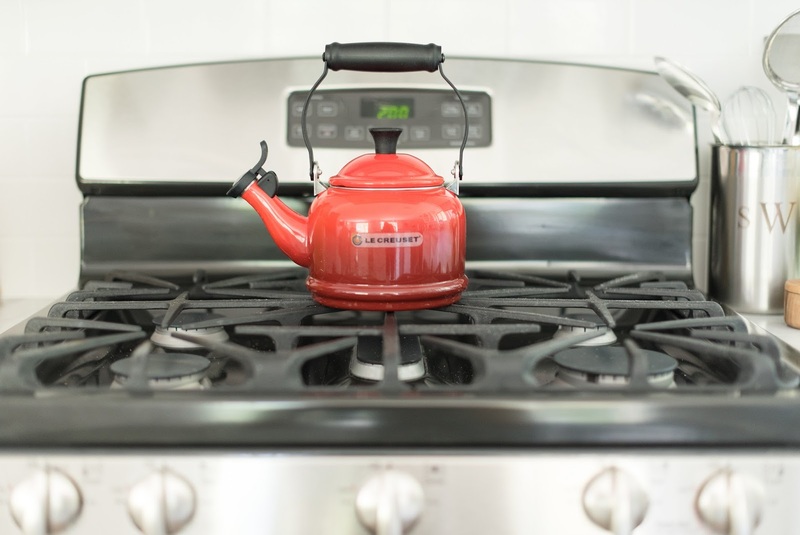 We decided to make the move to a gas range in this house and, despite some (scary-ish) issues with the hook up process, I am loving our decision. I'm kind of weird about stuff laying around on kitchen counters so I make tiny little vignettes of pretty things and then stash everything else in the cabinets. The cutting board and salt well below is Greek Olive Wood from our Babymoon in Santorini. The original shape of the kitchen was a very strange galley style with a crooked angle under the windows. We rounded out that angle and extended the cabinetry to blend the dining room and kitchen. By doing so, we also gained extra counter space and made that angle a little more pleasing to the eye. 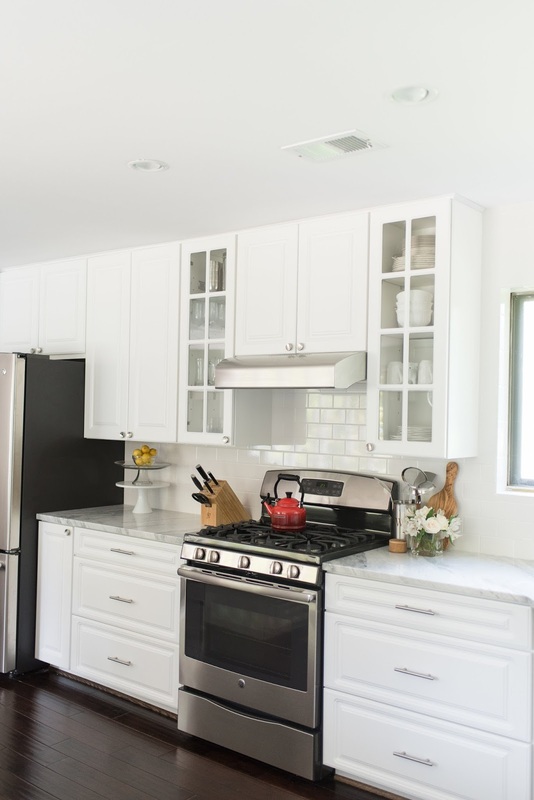 It's hard to tell, but if you'll look closely, you'll see that every single inch of wall space is covered with white subway tile - all the way to the ceiling! That was a style decision that I made early on and not too many people were on board (side eyes to all of you) but once it was complete, even the construction guys told me that it looked "nice". Side Note: we are replacing the windows we just need a little break from construction. Can you blame us? Side Note #2: the skinny drawer below the stand mixer is the dedicated spice drawer. The thrill I get from announcing that is borderline crazy town. 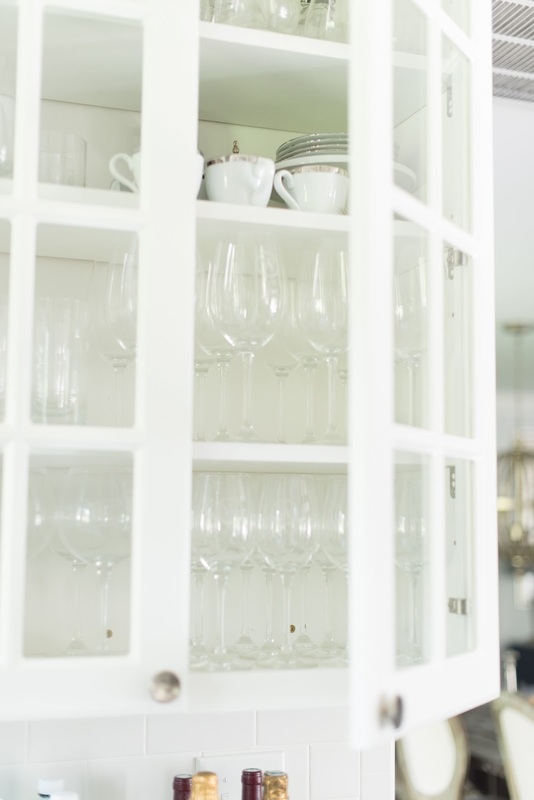 Between Justin and I we have three sets of china (our wedding china, his mother's wedding china and my grandmother's wedding china) so I knew we needed a few glass cabinet doors in our space. I love that the glass breaks up the working wall and keeps things light. 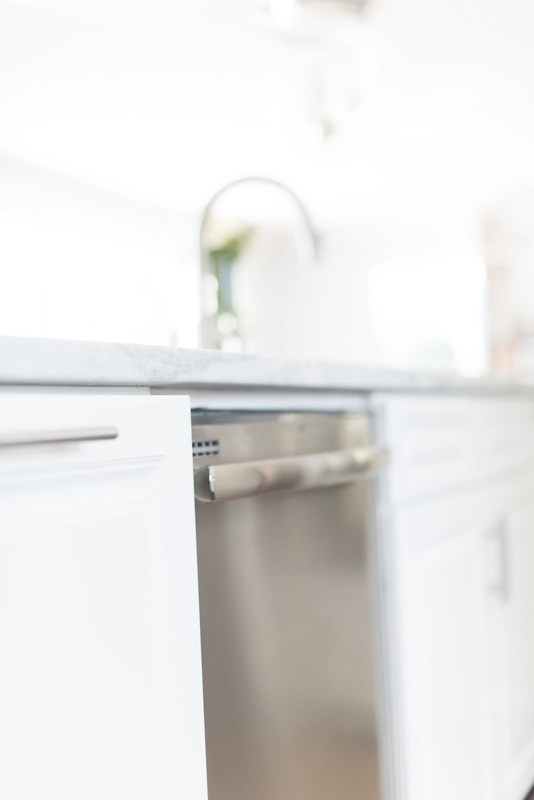 Thanks to a few interesting twists and turns in the renovation process, our cabinets are a mix of special order Home Depot cabinets and custom pieces. It's a long story. For cabinet knobs we went with a traditional look but kept things interesting by going with a completely different style for drawer pulls. The knobs are just generic silver round disk pulls from Lowe's and the pulls are actually knock offs from a discount construction supply store. 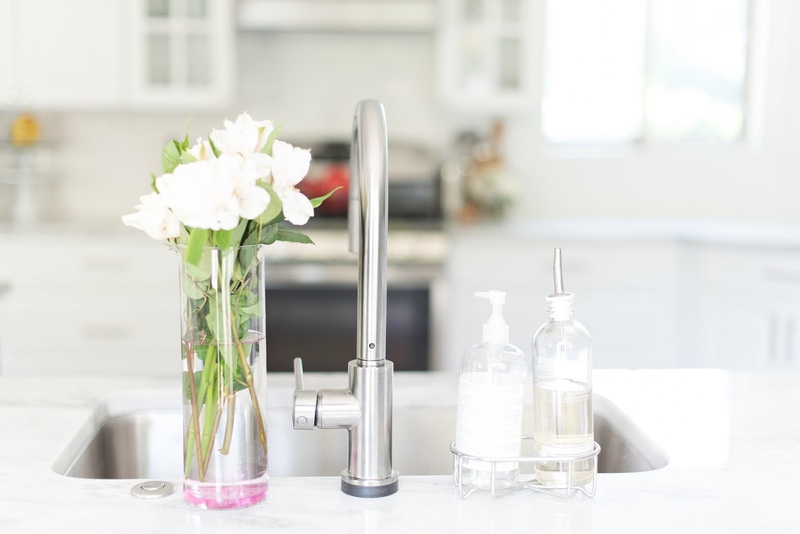 The kitchen sink is by far one of my favorite features. I wanted a giant stainless steel square bowl - no dividers and as deep as possible. 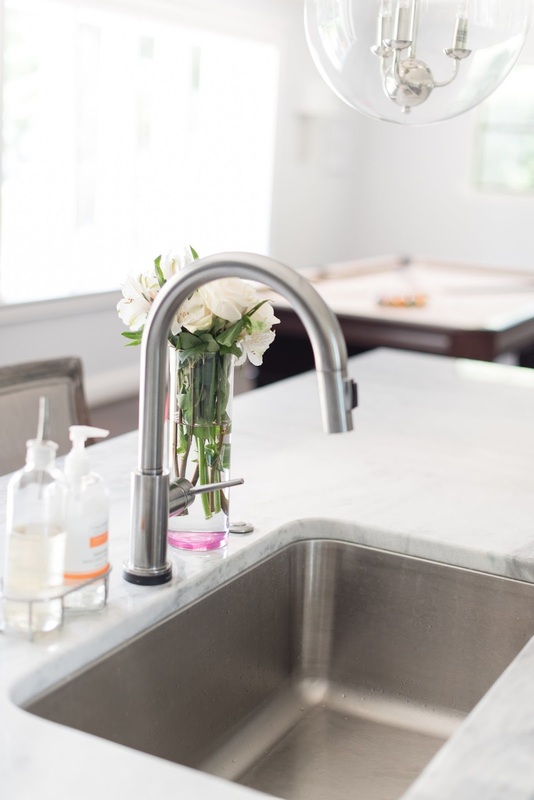 I sought out Caroline's advice and she and I decided on a 16 gauge stainless steel sink from Ferguson's Mirabelle line. 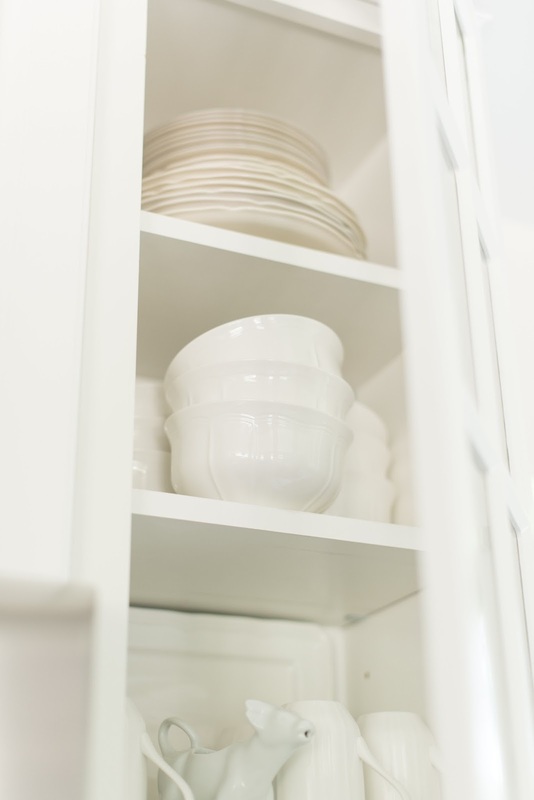 I honestly love it so much because (brace yourselves for honesty) of the amount of dishes it can hold before you can actually see any peeking out. Sorry not sorry. 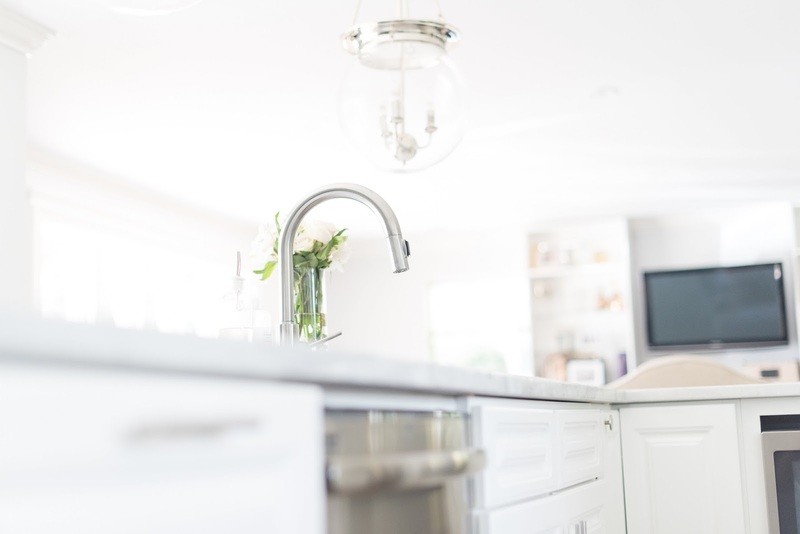 My husband's favorite features in the kitchen are the touch faucet (a housewarming gift from Caroline!) and the air switch garbage disposal button. 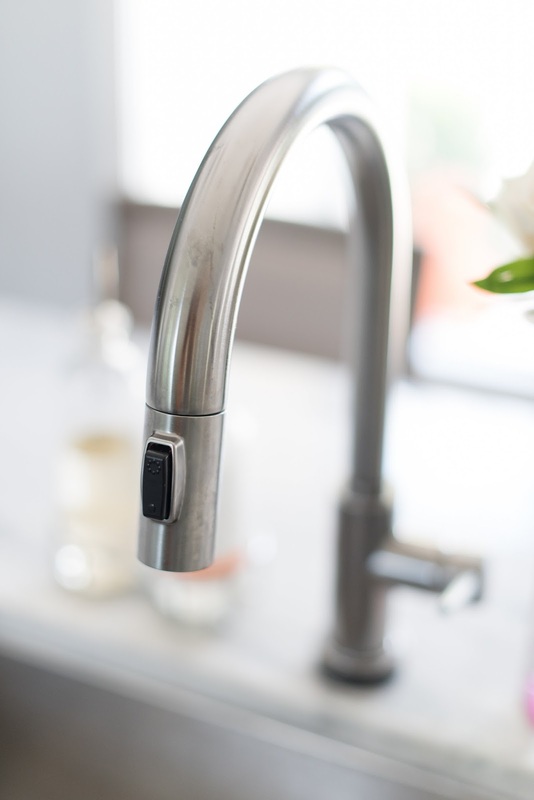 Because we didn't want to mount a switch for the disposal on a wall that was quite a few feet away from the sink, we decided to mount a push button start next to the faucet and honestly love it. I called in Caroline (yes, again) to help me find the perfect globes for the space. 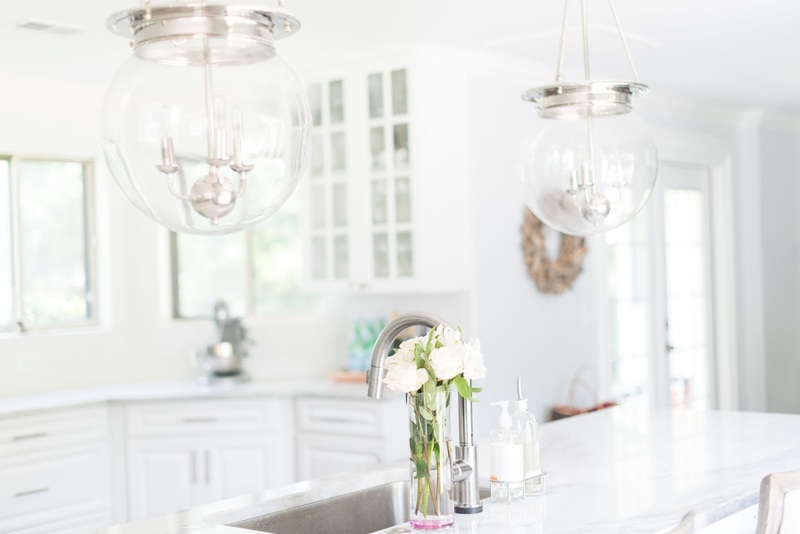 Because our sight lines are so open, I knew I wanted two huge clear glass orb pendants. 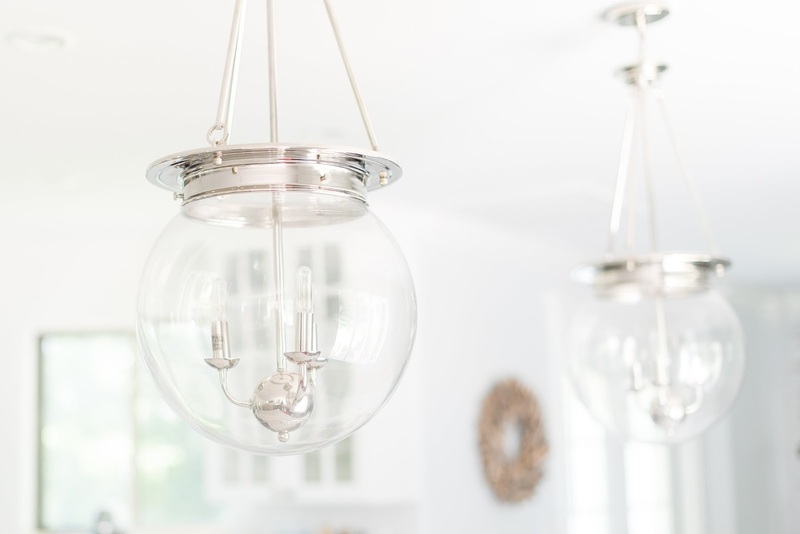 I'm not afraid to add a little attitude to a space (see: my dining room pendants) so I was open to all suggestions - and I am so glad that I was because these babies are perfection (if I do say so myself!). Ready to chat about the island? We worked with our contractor and drafter to ensure that our space was functional and as open as possible but their biggest task was humoring my giant island concept. 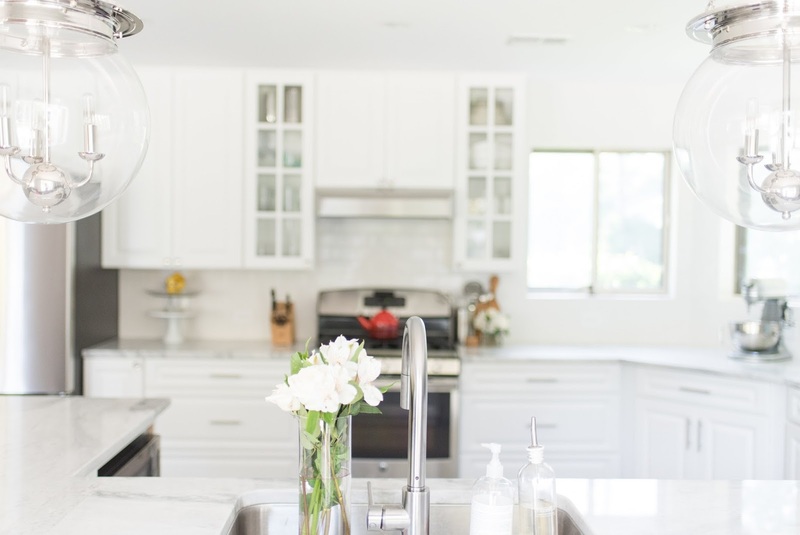 I wanted the island to seat a ton of people, house the sink, dishwasher, trash drawer and under mount microwave and I wanted my kitchen sink to be a clear sight line to everything in the main living spaces. What can I say, I'm a girl who knows what she wants in an island. It took some measuring and negotiating but I stood strong and my island dreams came to life. The island seats seven adults, or six adults plus one high chair, comfortably. 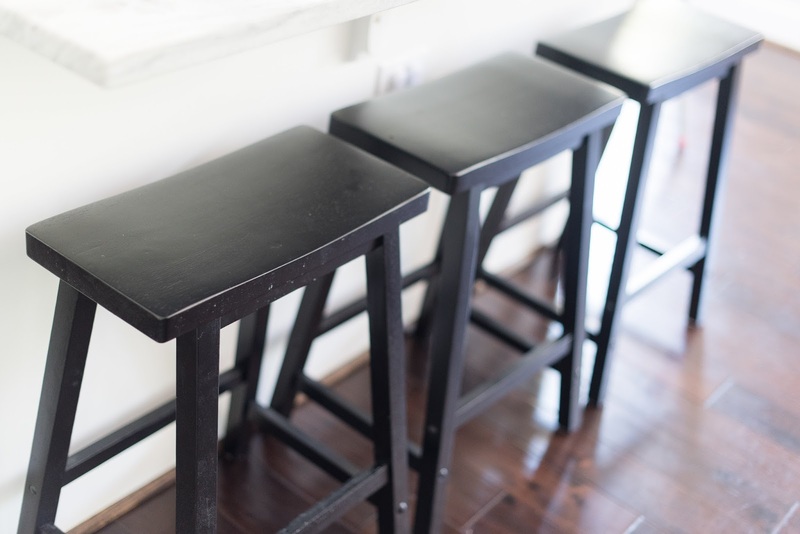 We chose saddle seat counter height stools for the L shaped portion of the island that bridges the living room and kitchen to keep the sight lines open. 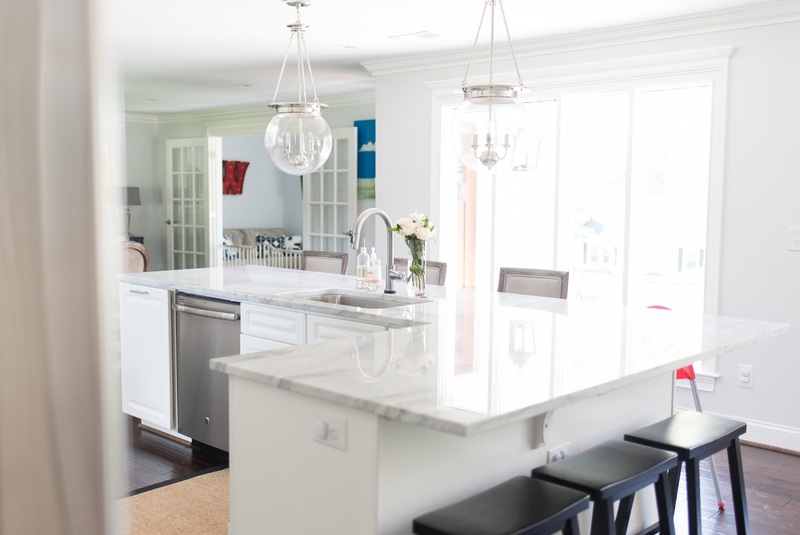 On the kitchen sink side of the island, we went with full backed, gray linen counter height stools for comfort and to bring in a bit of warmth. 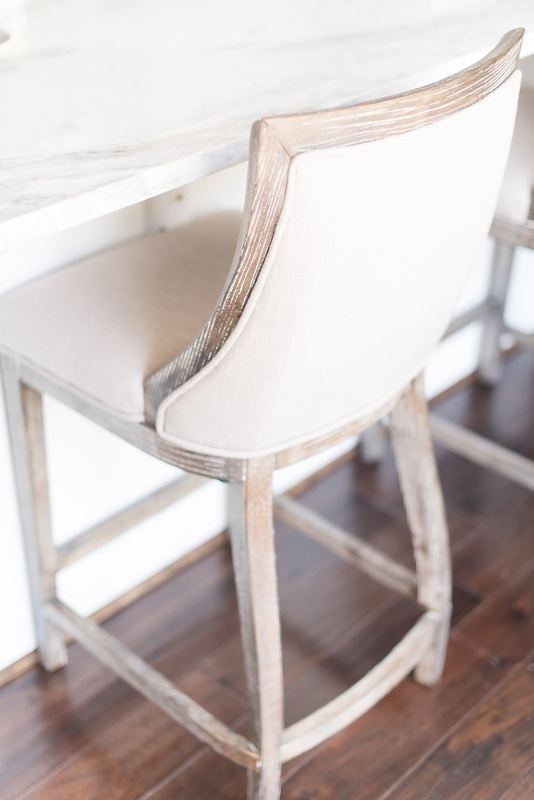 I love how the wood of the gray bar stools is a perfect match to my dining room chairs and marries the two spaces together - such a find (and my first ever purchase) on Overstock! 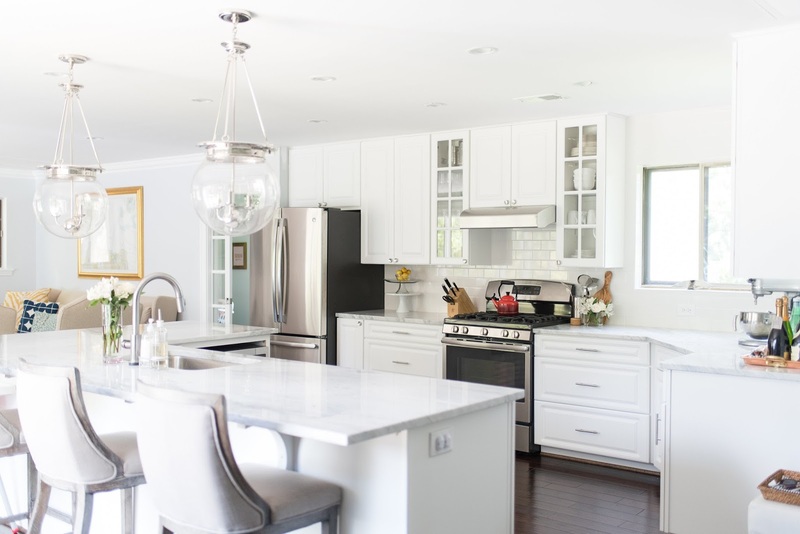 We entertain in our home a ton and I love the flow and layout of the kitchen. People can congregate around the island and still be a part of the party. Bonus: you can see into the playroom from most points of the island, making the mamas in the crowd happy and relaxed. My clutter free counter top loving heart loves that microwave nook so hard. 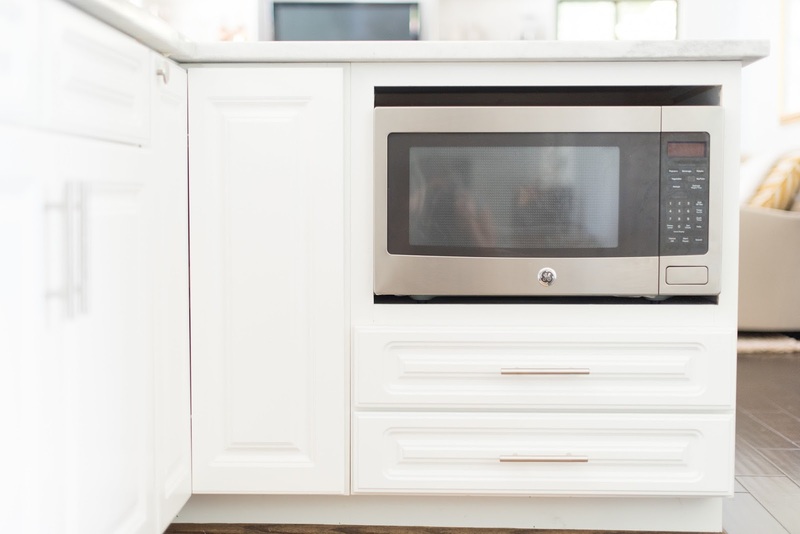 The island has something like 5 power outlets on the exterior (another Must Have for me), just under the counter top, so that you can move small appliances around or plug in your lap top and work from any spot in the kitchen. 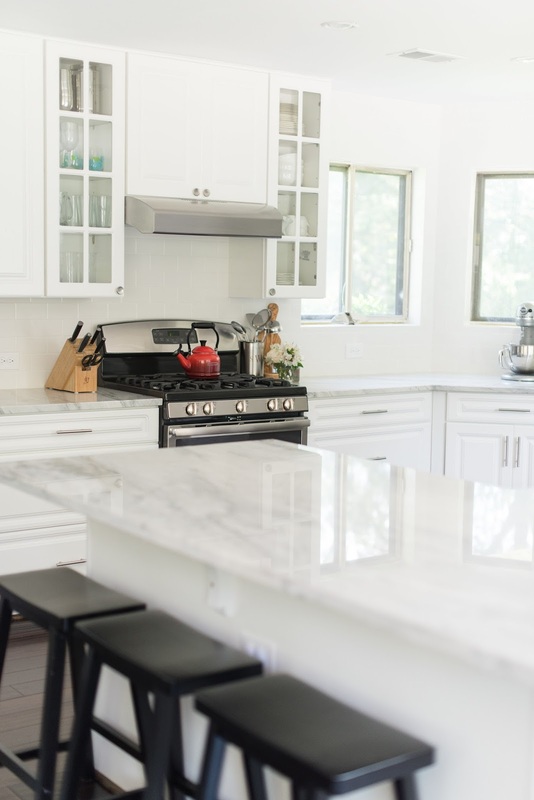 In case you missed it, I detailed our search for our granite in this post but I'll give you the abridged version here (because this post isn't long enough or anything): we knew we couldn't live a Carrara lifestyle but we desperately wanted the look. We combed what felt like every single stone yard in the state until we found Monte Blanc granite. The soft gray swirls remind me of the striations found in Carrara and the bright white coloring of the stone makes my design novice heart happy. We ended up needed three slabs for our project and I'm glad that we found a stone that fit the look we were dreaming of (that's a ton of stone, using one that we only liked would have been a deal breaker). 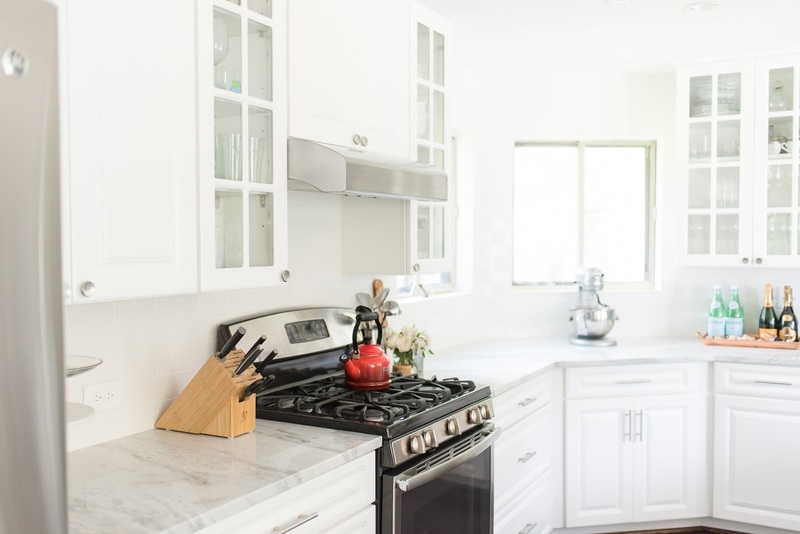 I fought (again) for a blunt, sharp edge to our counter tops - I like the clean lines and, despite the efforts of the granite guys to steer me towards a rounded corner, I am thrilled with my decision. Just a few more glamour shots and then we're hitting the source list. For the record, as much as I hated this reno process, I do love the final outcome of this space. I had a very strong vision and am glad that everyone eventually gave in to my wild ideas. It was a battle but this one was worth it. 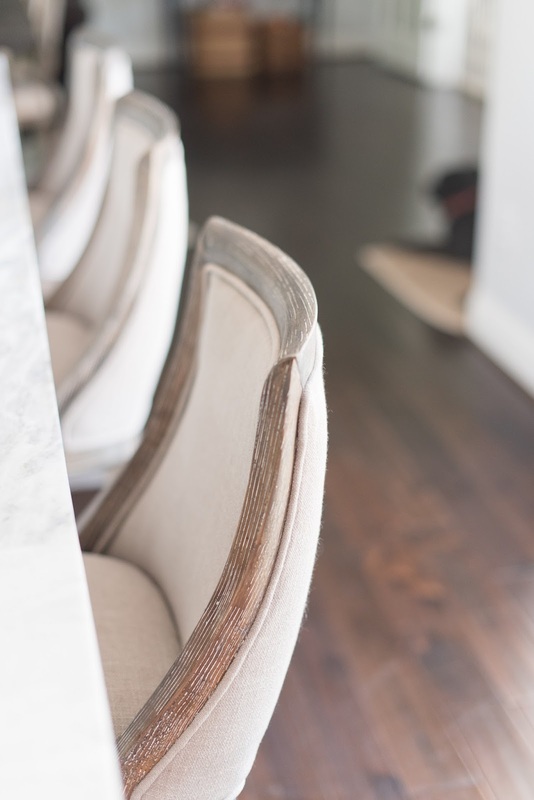 If you want to see more of our Renovation, check out our Dining Room Reveal! If you're interested in how our granite has held up a year after finishing the renovation, check out this post. That sink is legit! It can totally hide so much stuff! Also obsessed with the pendants we choose! Stop it. This is my dream kitchen! How have the counters held up in the cleaning/staining department? And how is G liking his high chair? I like the Ikea one too but so many people seem to be going for the cushioned ones. I am BEYOND jealous of this kitchen. We are still trying to figure out how to open our space to give me what I want. This is a dream!!! Your island vision is incredible. Way to make it come to life! And I am still drooling over the glass orb pendants. I love your kitchen! We moved into a house where the kitchen had just been opened up and redone by the previous owner. 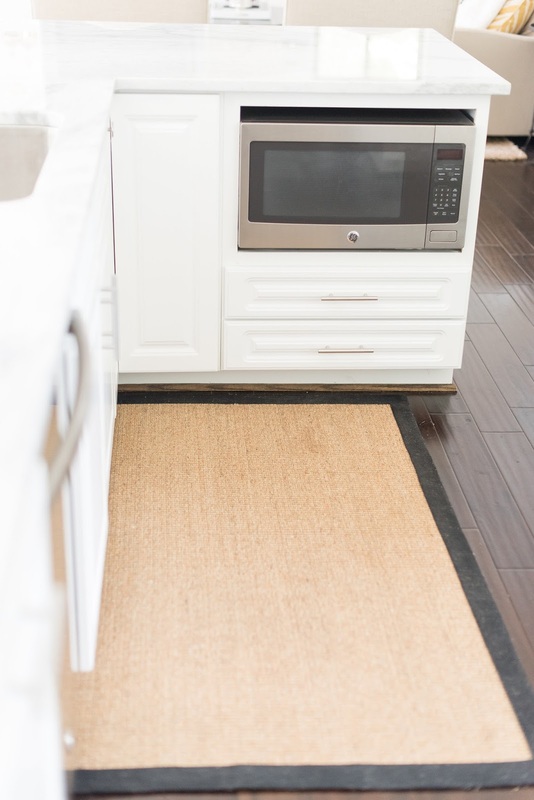 I loved that they too did a large drawer for the spices, deep drawers for the pots, and had the microwave underneath. I just wish our sink didn't have a divider and was just one huge basin like yours. 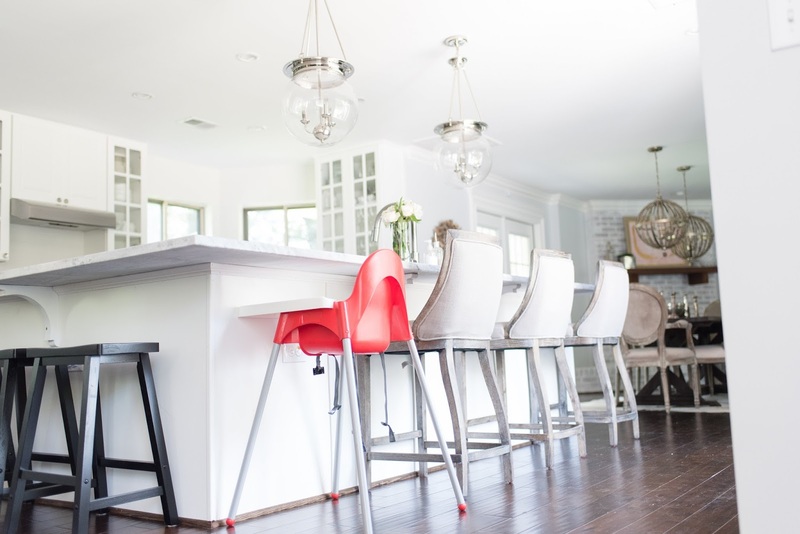 I really love your light pendants and the linen bar stools! I also wish I could keep my counters clean! I feel like they are constantly cluttered with drying racks and my toaster and vitamix and mail and other junk! I love the previous kitchen more. KIDDING. I love your new kitchen, gorgeous, what a dream kitchen for anyone. Your house is becoming more and more beautiful every time you show an update, I really hope this is your forever home :) because it's perfect! Stunning- not exaggerating... Stunning! 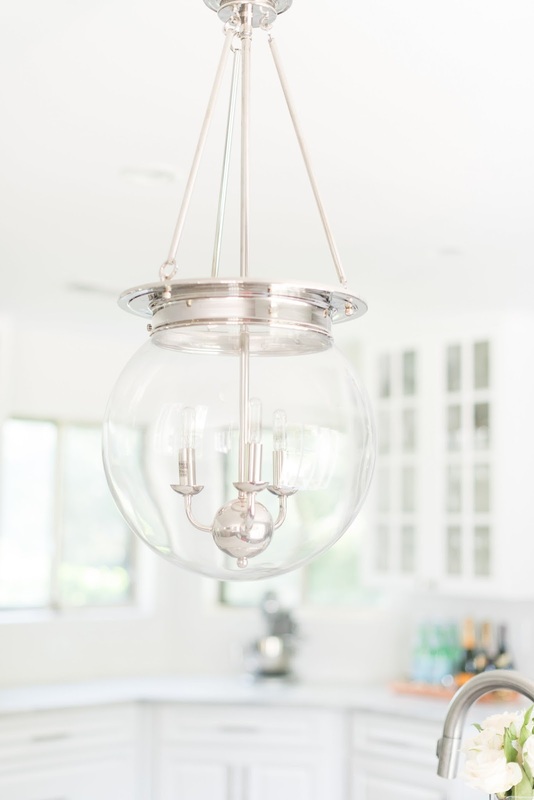 We just bought 2 new light fixtures (via overstock) for our redesign and I cannot wait to get them in my grubby little hands! I flipping love this kitchen. Amazing. 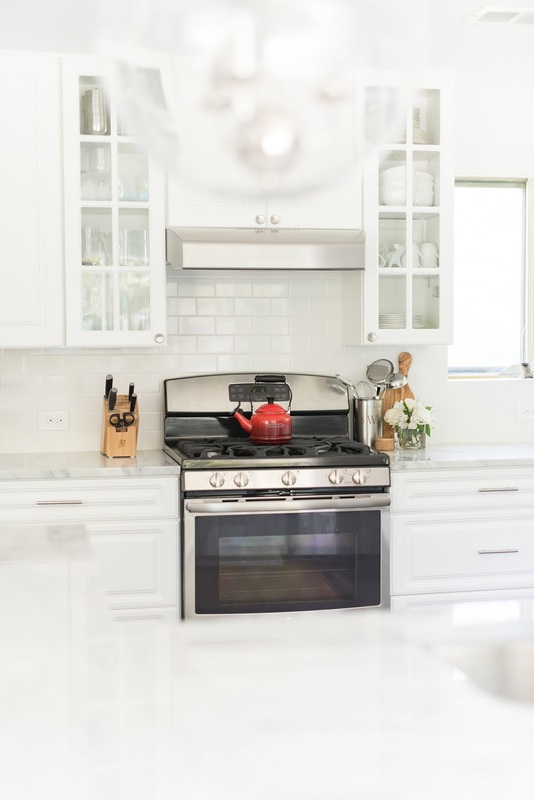 I just told my husband to look at it and asked him when I can have a kitchen like that, and he told me to "photo memory" it (what?????) for one day. Sigh. Living vicariously through your gorgeous photos! Seriously GORGEOUS! I've always wanted to design my own kitchen but think it would be extremely hard to actually make the decisions come time to do so. 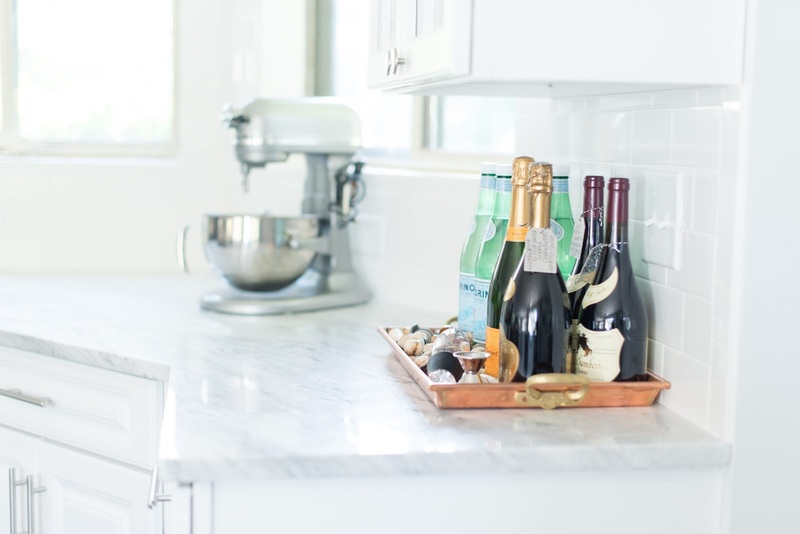 But your kitchen is totally my inspiration because its AH-MAZING! Girl...this is amazing. I am a little green over here not gonna lie! This is gorgeous and I love all your design choices!! White, white, white you and I were destined to be friends!! Full on kitchen ENVY!! It's stunning!!! Love the glass door cabinets to show off some great pieces. I'm a china lover too. That was the one thing I wanted the whole set of when we were getting married. 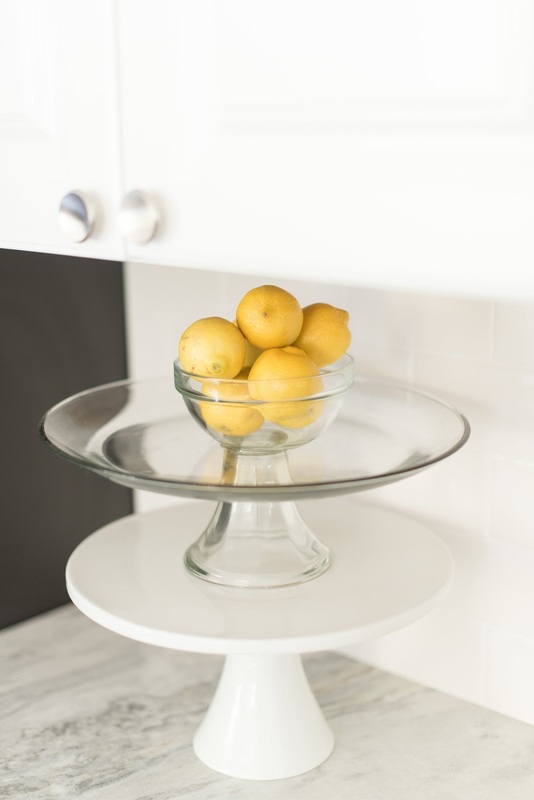 I'm also a stickler for clean counter tops. 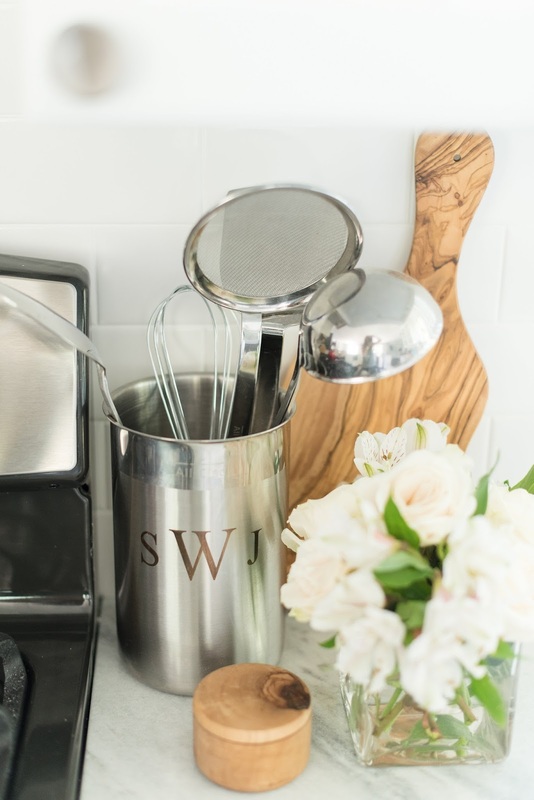 You have great counter space! You're kitchen is gorgeous!!!! It's so good you stuck to your guns and insisted on the things you wanted because I think everything is perfection! Oh, and I'm drooling over the highback bar seats! It is gorgeous! So much light. I'm so impressed with everything you accomplished! my sink is like that too and I love it. I guess I have lived in one too many apartments and now hate double sinks. The spice drawer, I will have dreams of it tonight. 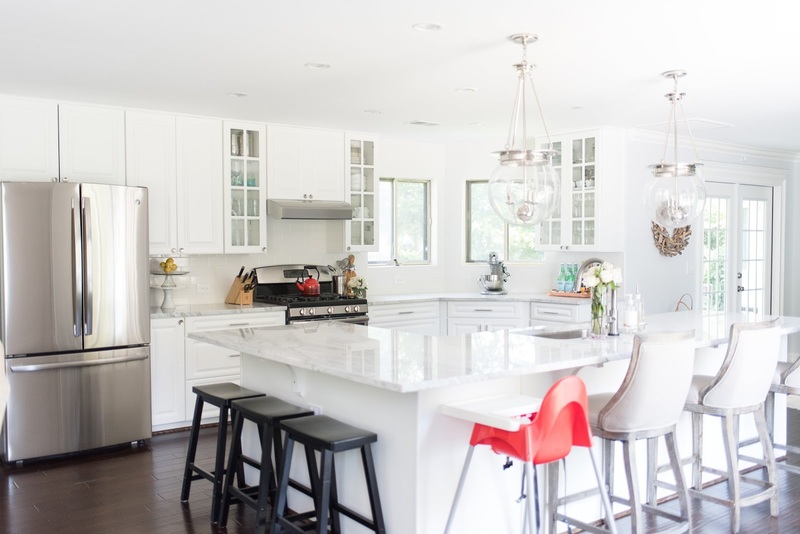 The huge island, the stools, the sharp granite corners. I think I have a crush. 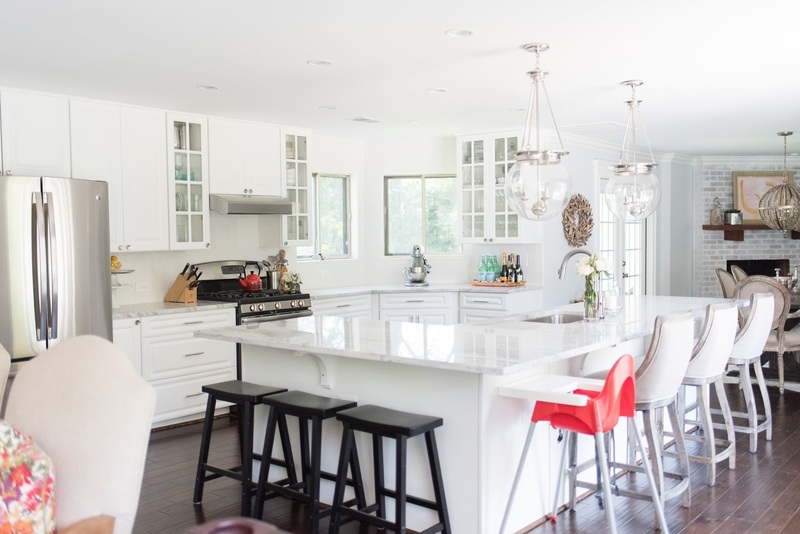 I'm so obsessed with this kitchen, it's not even funny. So so so gorgeous. 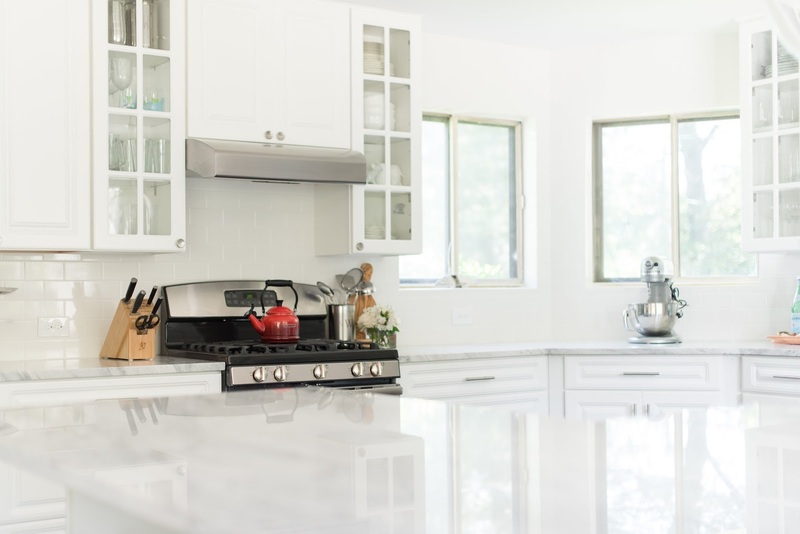 Question about countertop, I cant seem to locate a Monte Blanc in granite. This name keeps coming up for marble and quartzite. Any advice? You did such a fabulous job redesigning that sad space! I would kill for a dedicated spice drawer (and candy drawer for that matter!). This is my kitchen, except mine is smaller. Please, are you in LA, by any chance? Who is your designer? You've hit every note I would want in a new kitchen. 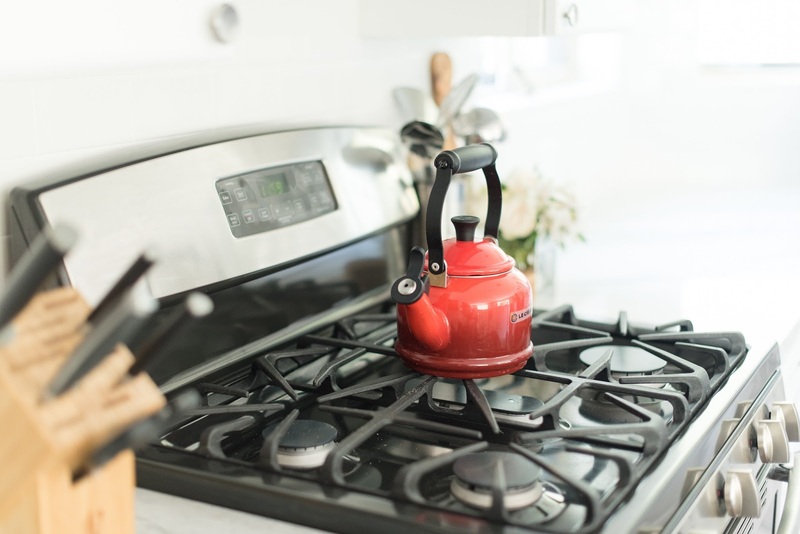 Your old is exactly what my current kitchen looks like only smaller! I love everything you did. any chance your contractor and designer are in LA? hey there! we actually didn't use a designer, just me and a drafter to make sure we got the most out of every inch! Unfortunately, we're not in the LA area - good luck with your reno! My dream kitchen! 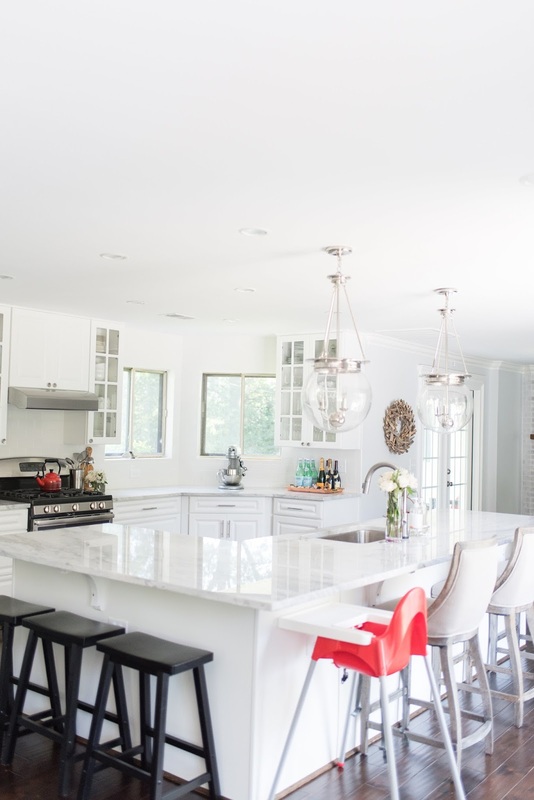 Any chance you know the manufacturer or name of your pendants lights over the island? Fantastic job on this project. Thank you so much for your kind words! 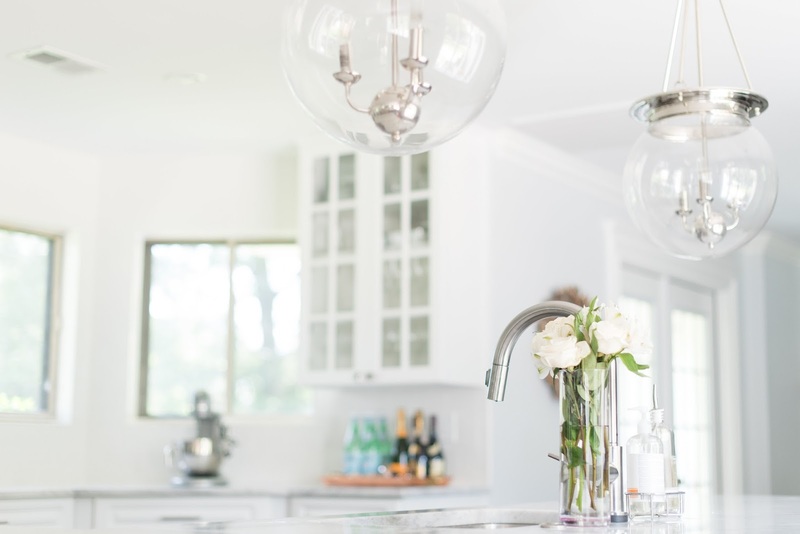 You can purchase the kitchen pendants by clicking on the words "kitchen pendants" in the list above - they sell out quickly and that's the last retailer where I found them in shock! So incredibly stunning a space! 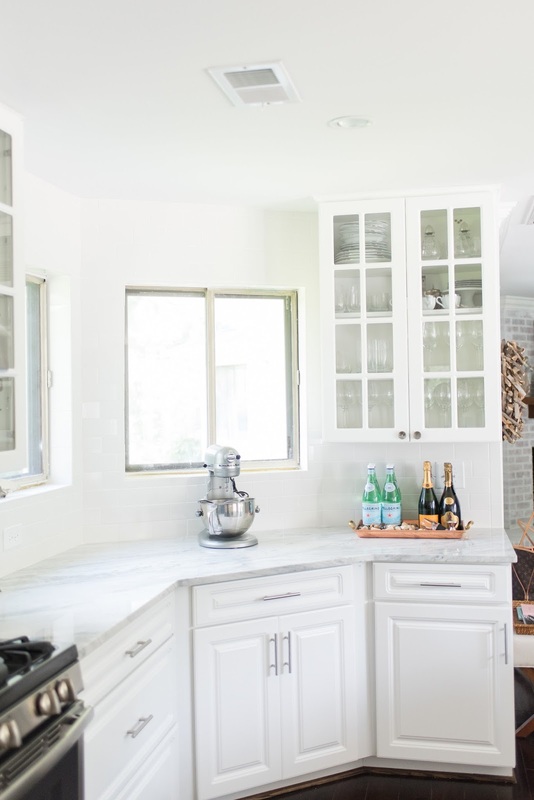 And I'm head over heels in love with those mullion-style, glass paned cabinet doors! Were those part of your Home Depot special order? I'd so appreciate advice on that, we're looking to renovate our kitchen! Thanks so much for your time!